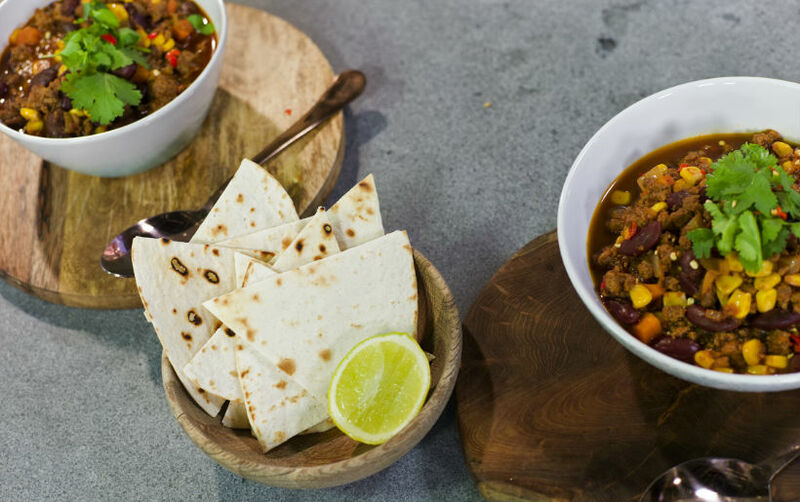 Serve with toasted tortilla wraps. Heat the oil over a medium heat. Add the Quorn and cook as per the instructions. Once cooked add the red onion, celery, carrots and garlic along with the chili before cooking until fragrant and the ingredients are slightly softened. Add the spices and toast in the pan with the other ingredients before adding the tomato paste and tomato sauce and stirring to combine. Cover the ingredients with the water and simmer gently until half the water has evaporated. Stir through the corn and beans before seasoning with salt and freshly ground black pepper. Add to a serving dish and top with the ado and coriander before serving with toasted tortilla wraps.